Products, crocheted, beautiful and practical. However dress or a blouse will look well only if the binding is done carefully. It is especially important to nicely handle the neckline, armholes and cuffs. The methods of cutting will be different for products from individual motifs and those that are connected in one sheet or of large parts. If you are knitting a sweater or dress from large parts (shelves, back and sleeves), doverite the shelf to where the neck starts. Find the middle of the row and either mark it (e.g. a knot). Then knit one half of the canvas. Gradually take away the loops from the side of the cut. The order of subtraction depends on the shape of the neck. For example, V-neckline promazyvaya 2 columns together in series, if the cutout is long and narrow, and in each row, if it is shorter. At the same time take away the hinges and openings according to the pattern. Generally, the part must be periodically applied to the mold and even pin pins, to check, whether correctly you do subtraction. Davaite to shoulder seam and close the loop. Tie the thread to the place where you split the knitting and do the second half part. The order of decreasing the number of loops will be the same, but the detail should be in the mirror. This method is good for products related to simple viscous, like columns with nakida. Crew neck fit about the same, only the order of subtraction will be different. Davaite detail before the start of the neck, divide the knitting in half so the same as in the previous case. Mark the middle, then davaite a number to the end, turn the work and davaite almost to the mark, leaving nepovezane average 5-6 bars. Again, flip the knitting, second row davaite to the end (line openings). 3, 5 and 7 series are not dokazyvaya 3-4 last column. Next knit straight, without the addition of subtraction, to the shoulder seams. Clip thread and tear off. Tie in the mirrored reflection of soul mate details. In knitwear often found and square neckline. He is. Davaite detail to the neckline. Completing the last row, find and mark the middle, then davaite a number to the end. Turn the work, start knitting the next row, but not dawasa to mid-12-15 columns, again, flip. The remaining rows knit straight, with no additions and bauleni. The second half is the same. 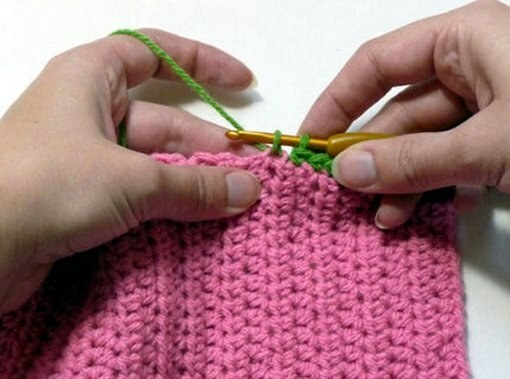 If you knit, the product of the individual motifs to make the necessary number of squares, circles, or flowers, put them on a pattern and seal with a needle or hook. The neckline in this case can be done in several ways. For example, tie – first simple columns. Make sure that the canvas was not pulled together. You can then make a number of columns with nakida knit or lace that represents a combination of bars and chains in the next row promazyvaetsya group of columns.